once or twice a year, i end up in england on business. while over here, i try to make the best of the trip and get out to see some friends, participate in a race or just run/ride through the countryside. this time around, i started off the trip with a little race in new hampshire before flying across the pond. having worked hard last weekend, i wasn’t sure how i’d be feeling this weekend, but in the off chance that the legs still felt like being abused, i brought gear. i packed my osprey trail pack, amphipod hand-held, sleeping bag liner, headlamp and salomon xt-wings. i was prepared to get frisky with the english peak district. earlier in the week, i went out for a couple runs and was pleased to experience fresh legs. with those couple of successful runs under my belt, i made plans for something epic. i set plans in motion to go for a long trail run along the pennine way. i would have one of the lads from the office drop me off in crowden, where i’d pick up the trail, and head north. depending on pace and effort, i planned on putting in about 15-20 miles on friday evening and running past sunset. i had plans to just drop down into the grass [it's oh-so comfy out there] and sleep for a couple hours. i’d get up as the sky got light and head back out, running about 10-15 miles all the way back to the hotel. the start went off without a hitch. david, one of the lads from the office, had taken me by a shop to load up on food and i was all set with a couple sandwiches, some bread and shropshire blue and a huge hunk of parkin. i trotted up out of crowden, climbing the huge bluff looking down on the valley below and made my way into the wild. every few minutes, i came across sheep grazing. mostly young lambs with the mothers, but also the occasional ram. as i ran along, i was constantly reminded of their presence; the baa-ing echoing up out of the valley below. the trail wound along a steep cliff and continued to take me up higher and higher. every climb was a low angle, though and not steep enough to really see the length of the climb or what the summit would like like. eventually the route topped out somewhat in a high depression. the trail wandered along a stream, but then started moving into what appeared to be a bog. whether the trail truly died or if i just wasn’t paying attention, at one point i found myself wading through black peat. it was completely un-runnable, and each step i took sunk in well up to the calf. i carefully picked my way along, trying to stick to clumps of grass and trying to spot any area that appeared to be more worn or traveled than another. i scouted around and memories came to me of characters in books getting lost in the moors or wandering through the bogs in middle earth. it became quickly apparent how easy it would be to get lost out here, or to get stuck. i continue to gingerly navigate my way towards where i thought i needed to go, marveling at the terrain that was completely new to me. eventually, i spotted what looked like a trail and before i knew it, i was back on the pennine way proper. at this point, volunteers had lain slabs of limestone, end to end, to create a wonderfully textured path. i hopped a fence that marked the end of the bog area and followed the trail up a wonderfully dark hill. the trail topped out at a spot aptly named ‘black hill’. the wind was brisk and being quite wet from perspiration, i stopped only long enough to snap a couple of shots. it was absolutely beautiful, though. it reminded me of some of the remote, high desert areas in california; bridgeport, bodie. only here there was life, everywhere. sheep grazed, grasses grew, birds scattered as i ran. i even spotted a momma, poppa and two baby grouse crossing the trail. england’s green and pleasant land, indeed. from black hill, the trail dropped elevation and eventually crossed a motorway, depositing me into the wessenden reservoir area. the trail continued to drop down and i made a mental note that i was going to have to climb back up that again at some point. the trail wound through a section of countryside where huge caverns had been carved in the earth by running water. i could hear it echoing up from the black areas. strange bird sounds echoed across this area and i could easily see how someone wandering through here could come up with fantastical creatures and mythical stories. into the reservoir area, i started seeing mountain bikers and the occasional walker. i figured i was nearing the m62 and a more populated area. the trail hooked up with a dirt road for a while, but then cut back off onto the customary singletrack. after a tough climb up out of a deep canyon, the trail met with a radio antenna on a hillside. it offered a great vantage looking down on the reservoirs and trail below. the sounds of the sheep baa-ing echoed up again. it was about 8pm at this point, so i decided to take a break and eat some dinner. i chowed on one of my sandwiches, had a little of the cheese [mmm, it smelled like feet but it tasted like heaven!] and then finished off the meal with a couple bites of the parkin. oh, man, was that good. it was like a spice cake with molasses added in. it was moist, flavorful and went down easy. i think i discovered my new long-run solid food favorite. i waited a bit for the food to settle and then headed on. within another mile or so, i hit the m62 and decided to go ahead and turn around. if i ran part way back, i’d hit about 15-17 miles and that’d be a good start, leaving about 13-15 miles for saturday morning. i turned around and headed back the way i came. the neat thing about running the out-and back, was seeing the same area from the reverse perspective. while the terrain was more of the same, it was neat to see the trail wind down below, or up above, where i hadn’t been able to see it before. as i ran along, the sun finally set and the sky made it’s slow transition into dark. at about 9:30, just past the peat bog area, i decided to go ahead and find a spot to sleep for the night. i poked around the bluff-top and found a nice little spot, sheltered from the wind and with a good collection of grass. i pulled up some more grass to give some extra padding, pulled out my sleeping bag liner and changed into some dry clothes. i ate a little more of the parkin and then crawled into the liner to get some shut eye. no sooner had i started to doze off when something taping on my face woke me up. i was a little confused as to what it was and then i realized it was rain. it wasn’t coming down hard, but the clouds overhead looked as if they had a load that they were itching to dump. i had a rain shell, but nothing to keep my lower half dry, or my gear, so i figured the smart thing to do would be to pack up and head on out. within a couple miles, i was back at the trailhead and it wasn’t even 11pm. there was a small village up the road and i’m sure i remembered seeing a pub [duh, what village doesn't have a pub?] so, i put the headlamp on backward, flashing and headed out along the road. after about 30 minutes or so, i rolled into tintwistle and came to a stop in front of ‘the old oak’. the lights were on and i could hear voices inside, so i took a minute to cool down, stretch and then in i went. i must have been a sight. i was still wearing shorts, my legs, shoes and socks were covered in black mud and i was wearing a bright orange rain shell. i walked up to the pub, asked the barmaid for some water, a pint of bitter and a taxi. the two lads at the bar headed outside for a smoke, so the barmaid chatted me up while i waited for the taxi. turns out her husband is american and currently working in florida. after a couple of minutes and about half way through my pint, two new lads came in. i could tell that they’d been at it for a while as the one closest to me was having a hard time ordering and every time he’d turn toward me, he was close-talking. he took a real fancy to my orange shell and kept commenting on how i looked like a carrot. i tried to make light of his comments, saying, “yeah, all i need is green hair”. but you never know with those types of situations, whether the guy will laugh or take offense. he seemed to be in good spirits, but he was so off his rocker, that i was glad when the driver came in and said, “taxi for jeff”. it was a quick drive back to the hotel and it was before midnight when i pulled up in front of reception. it wasn’t the ideal end to my adventure, but i’d had a good, solid 21 miles on the pennine way and had a new appreciation for the wilds of england and it’s authors who wrote about it. the day dawned early after a restless night sleep. it seems even warren received a better night sleep that i, and he was in a bag on the floor of the b&b. despite the poor night sleep, i felt fairly alert and ready to race. the week leading up to the race had been touch and go. i had been experiencing a very tight lower back [due, mostly in part, to the stress of all the plans for the month of june, no doubt]. i had run on it successfully a couple times since it started bothering me. when i crawled out of bed on race morning and didn’t feel the familiar tightness, i knew i’d have a good day. i had slept like a baby at flipperhead’s place the night before, so even with a poor night on race night, i knew that i’d rested well on the important day. pre-race nutrition and hydration were mostly intact and aside from forgetting a transition towel and goggles[!!! thanks for saving me there, warren], things were going smoothly. warren and i grabbed some quick food from the b&b and headed out to the start. transition setup went quite smoothly and i was set to go quickly. i headed over to where bill and warren were racking to find out i’d just missed the heart-attack and drama of warren finding out he was missing a pedal. once again, the guys from mc cycle pulled through [that was the shop i'd shipped my bike through - great service and great guys]. by the time i made contact with the guys, all three of us were ready to head to the start. looking like a tootsie roll brigade, we headed out. the first wave was off almost as soon as we showed up so we quickly waded into the lake for a water start. i did my part to warm up the lake [so glad i didn't have to go while swimming, that's such a weird sensation], although the water didn’t bother me as much as it seems to have affected warren and bill. we got the “go, go, go!” and we were off. i immediately had my face in the water and focusing on my stroke and breathing. about 100-150 yards in, i noticed my heart rate was through the roof and also that i was near the front of our wave. how did that happen? i backed off on my stroke and settled into a comfortably strong pull. i loved the swim course. the spacing of the buoys, not needing to sight into the sun, the calm lake [there was some chop, but not like ocean swimming], it was a perfect course. i rounded the last turn before expected and the finishing buoy came up quickly. i came out of the water in 35 minutes [4 min faster that wildflower, ifrc] and made a beeline for t1. i grabbed everything i needed and boogied out of transition. as i was trotting my bike to the exit, i spotted warren in t1 and shouted a word of encouragement. i was pumped and feeling good. i’d nailed the swim and that is always the leg that concerns me the most. onto the bike, i started hammering along the course. we had driven the route the day before and that had eased my concerns quite a bit. there were two climbs of note on the route [to be done twice]. the first was short and steep, not unlike the hill that i live on and the second was long and gradual, not unlike the the climb up jamboree back home. both were manageable and in reality, when i hit them, they didn’t pose much challenge. i really felt like i was being somewhat competitive on the bike. i’d get passed on the downhills, hold my own on the flats and pass most people on the climbs. i’m confident that no-one on a tri bike passed me on a climb. that made me happy to have not spent money on a tri bike, but instead opted to rely on my trusty felt. i must have pushed a little hard on the first loop, because when the second came around, i was posting positive splits. somewhere around the 40 mile mark, i tried stretching out my hamstrings on a downhill. i noticed a distinct tightness and pain in my left lower back. uh-oh. i hadn’t thought about how the bike would affect my back. on the rest of the downhills, i decided to try to stretch out instead of spinning. i wasn’t too concerned yet, but i knew there was a possibility of having some difficulty when i headed into t2. by the time i hit mile 50, my legs were gone. my longest ride up to that point had been two 40 mile loops through santiago canyon [one of which was a 40/10 brick]. i was finding it hard to get up even the easy climbs, but i was so close to t2, the smell of the barn pushed me on. wellington state park came quicker than i expected and before i knew it, i was rounding the turn into t2. i looked at the watch and was happy to see 2:54 and a 19mph average. i came to a stop at the dismount line, unclipped and stepped off the bike. my lower back was so tight and in so much pain, all i could do was shuffle into transition bent over like a crone. i was having such a GREAT race, and now i’d been thrown this ugly curve-ball. what to do? could i run? could i run 13 miles like this? should i dnf? i moved through t2 slowly and shuffled my way onto the run. i’d try a little bit and see how it felt. from the runs earlier in the week, i remembered how the more i ran, the better my back had felt. i stood up straight after i crossed the run mat and took a couple steps. i stopped, did some quick stretches and started off again. i received some words of encouragement from volunteers and those propelled me into a proper run. slowly, i worked on my pace. it hurt, but the pain was manageable. i just kept moving, hoping that my theory was correct. by mile four, i was able to run a fairly normal stride and had sped up to somewhere in the mid 7 min mile area. that pace and the pain really took it’s toll, though. by the time i headed out on the second six mile loop, i had to back off the pace and was relegated to somewhere in the high 8 min pace and eventually the 9′s. i estimate that i lost about 15 minutes on the run, based off of what i was able to do in all of my brick workouts. by the time i hit mile 11, though, i could smell the barn again and any pain and fatigue be damned, i was going to power into the finish. i stretched out my stride and did my best to put in a good finishing kick. about this time i spotted bill heading out on his second run loop. he waved and shouted and all i could do back was give him the thumbs up. i hit the final turn, made the run along the beach and then turned into the finishing chute. i flexed and waved as i raced down to the finish, my name was called, i crossed the line and i was done. i staggered through the finishing area, grabbed a ton of watermelon, ate crackers, drank and just basked in the realization that i didn’t have to exert myself anymore. after a while, i remembered that i was DONE and turned around to look at the finish line clock. it said 5:37. how long had i been eating? i wasn’t sure. dropping four minutes from the time gave me 5:33 and i was sure i’d been done for more than three minutes. had i broken 5:30? my goals for the day had been broken up into my traditional bronze, silver, gold. bronze being “finish upright”, silver had been sub 6 hour [pretty much tying my performance at wildflower] and gold had been to break 5:30. i thought that was a lofty goal, seeing as how i hadn’t trained as hard as wildflower. seeing that time on the clock, confident that i had indeed broken 5:30, despite the back pain and dropping some significant time on the run, was the salve that soothed the poor run performance and gave me the feeling of success. i walked out of the finishers area, stretched a bit, went and stood in the lake for a while and just continued to bask in the joy of being done. soon enough, bill came through the finishers chute and then shortly after, warren. it was great to have the two of them there to celebrate with. both of them had experienced great races and based on their reports, had a fantastic experience with the race. the race had been fun, challenging and exciting, but the thing that really made the day was the stellar company. our bond of friendship re-forged through fatigue and common struggle. we had emerged, heroes triumphant. we received a phonecall from smsmh’s mom on tuesday asking if we were planning on heading up to mammoth for the weekend. i vaguely remembered the trip being proposed, but had no idea of the dates or what the plan was. so, at the last minute, we decided to pack up and make the drive up to the mountains in the hopes of seeing some snow. the drive through the desert and up the 395 was fantastic, as always, but this time we had thunderclap along for the voyage. it’s a long 6+ hour drive, but the little guy did fantastic. we made one major stop in lone pine for breakfast and some play time in the park, but aside from that, he was content in the car-seat. as we rolled out of bishop on the last leg of the drive, we started to see flakes coming from the clouding sky. as we drove higher, the temperature began to fall and by the time we hit the turn off for mammoth, there was legitimate snow falling from the sky. we tried to point out the snow to tc, but i don’t think he was able to notice it in the moving car. once we stopped, though, he was in a state of wonder. i had to keep correcting him as he exclaimed, "bubbles! rain! rain! bubbles!". "no, thunderclap, that is snow!". with the temperatures on the frosty side, we opted to stay inside for most of the day on friday with a fire in the stove and just chill. the snow was slated to continue through noon on saturday, so we had our fingers crossed that we’d have some time later in the weekend for tc to get out and play in the snow. i got up early on saturday and headed out with the sunrise for a run and was greeted to a cloud-free sky. honestly, i was a little disappointed as i was hoping to run through the storm, but sun on fresh snowfall is nothing to sneeze at, so i ran the run before me. i took a fun loop through the backcountry and ran on some jeep trails. the elevation gain was significant and the going was challenging, but it was a complete joy to be out in the snowy wild. upon returning to the condo, i found everyone awake and the skiiers in the family already on the slopes. so, we packed up the sledding gear, thunderclap, smsmh, grandma and sisalopehead and headed over to a slope to let tc have his first snow experience. he was immediately in heaven. he was digging in the snow, rolling around, trying to slide, throwing it and just having a ball. i took him a little way up the slope and plopped him in the saucer and let him slide down the hill. this produced a cacophony of squeals and shouts of MORE! and ‘GAIN! over and over we let him slide down the hill until smsmh and i were pooped from hauling him around through the snow. 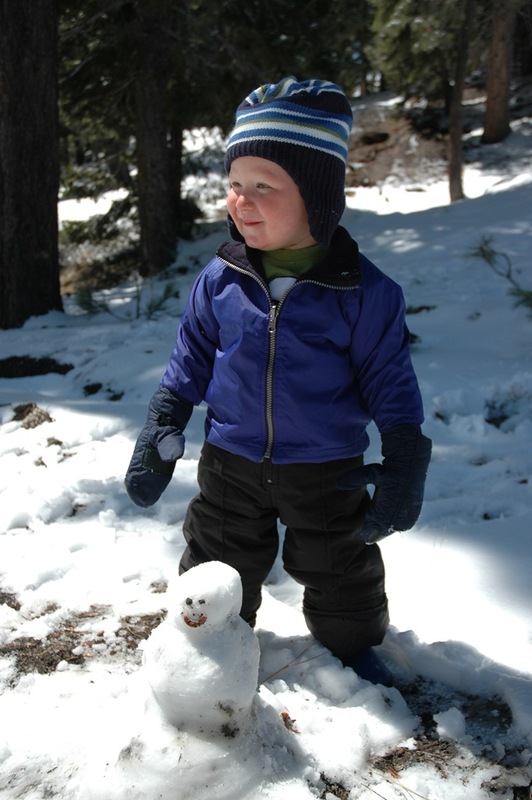 we took a break from the sledding and sisalopehead entertained him with the making of a SNOW…MAN! again, he was transfixed as this powdery white stuff was transformed into a shape that he recognized. and once the face was added, he had to exclaim over and over that it was, indeed, a SNOW…MAN! the rest of the weekend was nice and relaxing and we topped off the trip before heading home with a visit to the massive volcom brothers skate park. smsmh’s brother hopped on his board and tore the place up. before long, though, it was time to head home and bring the weekend to a close. tc, though, is still re-living the adventure, telling everyone he sees about the SNOW! he played in this past weekend. i’m excited about many more opportunities like this in the near future. there’s nothing like experiencing these new things through the eyes of a child. what are we doing? this facebook thing, the social networking, twittering, etc? what is it we’re doing? i see some validity to the technology and believe me, i love it. but when do you use it? at work. at home. at times when your attention is most required away from said technology. so, our economy is tanking, people’s livelihood is threatened by layoffs, our children are to be saddled with ridiculous debt and the world economy is suffering worse than in most of our recent history and all we can do in response to it is micro blog and make silly links with people from our distant past? are we that elitist? don’t we see what a huge middle finger that is to the people suffering? i’m logging off. my time is needed elsewhere. work needs my attention. god forbid i get fired for goofing off on facebook during this economy. my wife needs my attention. yeah, it’s funny that we both sit on the couch at night on our respective laptops browsing our communities, but what life is that? my son needs my attention, not a father distracted by checking peoples status on his iphone. i’m going to take that time and apply it to something productive and stop flipping the bird to the rest of the world. i’m keeping the blog, you silly people. i’ll keep up with my rss feeds, too. that’s like reading the morning paper for me. duh. or, this could be titled, "zipper quigley and the no good, super bad, ridiculously ugly day". i like the second title, better. so, i’m diving into this race report from a somewhat depressed perspective. folks know me as the eternal optimist, the goofball and the encourager, but i have to be honest. saturday’s race broke me and i’m still trying to mentally recover from decisions i had to make. race day came early with a 2:30am alarm and a quick scramble to get out the door and meet mr. k for a carpool to the start. i was feeling quite well, considering the week+ leading up to race morning. tc had come down with a respiratory virus the week after thanksgiving, spent some time in the emergency room and an overnight in the hospital and then lovingly passed the virus onto dear old dad. down for the count for the week leading up to the race, i spent every day resting and micro-analyzing my lungs and their ability to provide my body with the oxygen necessary to race. friday morning i made the call to race, sensing that the lungs had recovered enough. at the same time, that call was probably one of the worst mistakes i’d ever made as a husband. smsmh had come down with the respiratory virus as well and i’d be leaving her at home with tc for the entire day on saturday. it was selfish and, well, just a plain bad decision. so, with untested legs, gimped lungs and poor marital decisions weighing on my mind, i hopped into the car with mr, k and headed off to our 5am start. the start had one of those great vibes. our wave was full of people that i run with day in and day out and some people that i see on rare occasions and really enjoy. we were all smiles, if not a little chilly, and ready to go. knowing that it’d probably be about 10 degrees colder at the summit, i opted to put on my running tights rather than leave them in the 14mi drop bag. the start was sounded a couple minutes after 5am and we were off. mr. k and i headed up the 7mi and 2,500′ climb to main divide running conservatively. the climb was uneventful and we were treated to a full moon moving in and out of the clouds. as we climbed toward the trail junction, though, the temperature dropped significantly and we moved from clear air up into the clouds. it was cold and windy, but not too uncomfortable at that point. we hit the first aid station at mile 7, took on water and moved on quickly. feeling pretty good, we cruised along main divide heading for the next aid station and the brutally steep 2,500′ drop down west horsethief. at mile 10, steve harvey popped out of the clouds and greeted us with a smile and topped off our fluids. still on top of the world, mr. k and i dropped down horsethief and headed toward the holy jim aid station. this section of singletrack, while beautiful, is steep, rocky and narrow. we quit the banter and focused on our footing. once at the bottom of the steeper section, we opened up the pace a bit and cruised quickly over the remaining distance to the holy jim aid station. still feeling good, mr. k and i joked with the volunteers, pretending to bicker like an old married couple. we had moved out of the clouds, and although it was still heavily overcast, at least it wasn’t raining and blowing. i tentatively thought about dumping my pack and rain shell and running up holy jim to the summit with as little as possible, but word from the volunteers that the bear springs aid station and summit aid station might not be set up yet changed that and instead, i had them fill my camelbak and i loaded up on food. off we went again, heading up the notoriously long and challenging climb of holy jim. we took the climb easy and the pace wasn’t too challenging. about half way up, though, and just about when the trail’s steepness backs off a bit, my right itb started to flare up. at this point, it was just pain and wasn’t producing the dreaded ‘locking’ so i continue to run on it. we eventually hit the bear springs aid station at mile 19, topped off on fluids and then headed up the final three mile climb to the summit. i started walking the steep climb out of bear springs, hoping to stretch out my leg a bit, but the tightness and pain just continued to increase. at about mile 20, mr. k turned to me and let me know that he was feeling really good and wanted to know if it was okay for him to take advantage of it. i know how those sorts of things go, so i encouraged him to head off on his own, hoping to catch back up to him at some point. i alternated running and walking on the way up to the summit, but i just couldn’t manage to shake the tightness and pain in my knee. the further up the climb went, the worse the weather got, too. the wind had begun to pick up and was now blowing rain, clouds and what felt like ice. my drink tube didn’t freeze up, though, so i estimated that the temperature was right above freezing. thankful that i’d kept my pack and rain shell, i put on the extra protection and was able to feel somewhat comfortable despite the conditions. once at the summit, i started seeing 4am starters and lots of familiar faces. it was great to see people and get a boost of encouragement. once off the summit, i began tentatively running the descent. on the less steep sections, i was able to keep a comfortable pace, but once i hit something steep, the knee would just lock up. after a short bit, the route took a turn down the upper holy jim trail. i was quite thankful for the terrain change from the rocky and loose main divide road to the sandier singletrack. i was able to move a little quicker but still had to watch my stride lest the knee give out and send me tumbling. by the time i hit lower holy jim, i was feeling like i could run normally again and really began to stretch out my stride. mentally i was feeling good and my hydration and fuel levels felt pretty decent too. i moved quickly down the trail and before i knew it, i was rolling into the holy jim aid station again. i grabbed my food and fluids as quickly as i could and asked how far ahead mr. k was. he had just left the aid station a mere five minute before me, so i made a big production of wanting to catch him and put the reed to his backside for stranding me on the climb up. honestly, though, at this point i was feeling well enough that i thought i could run the flatter section of the next climb and power hike up west horsethief and, maybe, just maybe, hook back up with him. i ended up yo-yo’ing with a guy named tom on the 2.5 miles to the base of horsethief and we chatted a bit about how brutal the conditions were up on the summit and how challenging the route was. he was still feeling pretty strong and pulled away from me after a little while. as the steep series of switchbacks came into view, i could see mr. k about a half mile ahead of me working his way up the swtichbacks. illating between loosing it’s satellite lock to auto-pausing due to my slow pace. it seemed i was stuck on the same .1 section of trail for a good 30 minutes. i tried to remind myself of how the knee loosened back up when i ran down holy jim and told myself that the same would happen when i hit main divide. finally, i moved off of the steep, rocky section of horsethief, but as i moved out of the cover of the steep switchbacks, i was presented with a new horror. the wind had picked up and was howling over the ridge line, bringing with it heavy clouds, rain, mist and again, what felt like ice. before too much longer, though, i was at the horsethief aid station and greeted by steve’s happy face. i asked him for some motivation and he responded with, "well, you only have 18 miles to go!" i told him, "thanks…that would normally make me cry but i don’t want to waste any fluid or salt." that got a laugh and with that, i headed back along main divide toward the summit. i ran what i could, but it was a mere shuffle at this point. i couldn’t get my knee to cooperate with much more and as soon as the grade got steep, the pain would reduce me to a walk. i tried hard to stretch out my stride on the flatter sections, but i just couldn’t manage it. the weather, which continued to get colder and more windy, didn’t seem to be helping, either. i slowly made my way toward the aid station at the top of indian truck trail and my mind began to process. i started thinking about the time that it was going to take for me to finish. fourteen hours? fifteen? sixteen? was i going to make it home in time to put tc down to sleep? i’d left smsmh at home, sick, alone with our little guy. i had to at least make it home before he went to sleep. was i going to have to walk the entire section back up to the summit? in this weather? would my knee hold out for that? and then what about the remaining 10 miles back down to the finish? would i be forced to walk that, too? the doubts came strong and fast. it was at that point that i was defeated. i left bob and corrinne and headed on to the itt aid station with the decision made. i’d turn and head down the mountain at that point and not run the whole route to the summit again. hitting the aid station at mile 37+, i informed them of my decision and made those irreversible steps down the mountain. they were hard steps. they hurt physically, and they hurt emotionally. was i whimping out? had i given up before my body truly had? i tried to shut up the second guessing and just press on. i ran. at times it was a shuffle, but the singular thought on my mind was getting down that ridiculous mountain, out of the weather, as quickly as possible and just.STOP.RUNNING. those were lonely miles. i saw no one. my ipod had died back around mile 12. even on the lee side of the mountain, the wind still howled. i tried to push my pace and kept telling myself to keep running. walking would take longer. i told myself that i didn’t need to save my knee any more since there wasn’t any climbing left. i reminded myself that it was only soft tissue and that it’d be fine once the inflammation was gone. i wanted to hurt at this point. i wanted the pain there to validate the decision i’d made. but the closer i got to finishing and turning in a brutally difficult 44 mile run, the less it really mattered and there wasn’t really anything that i could tell myself that could rationalize the disappointment of not completing the whole distance. 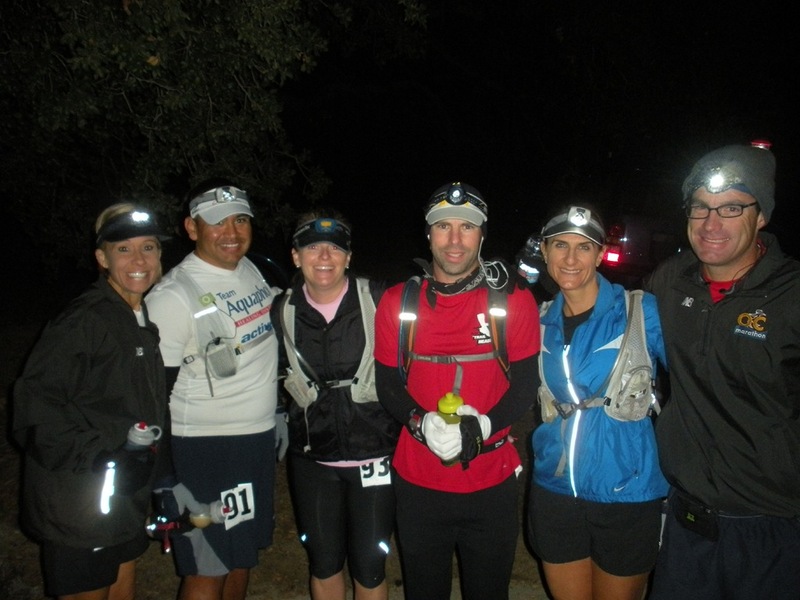 with roughly a mile to go, it finally got dark enough that i had to pull out the headlamp again. i had to slow my pace down so as not to eat it on the rutted road. eventually, i saw the coleman lantern ahead that marked the finish. as i came across the finish, i couldn’t wrap my head around being done. i was done. people clapped but i had to tell them that i was a drop. that hurt. it was good to see faces i recognized, though. darrell was there. seeing him and hearing his voice was such a welcome surprise. darrell, you have no idea how important you were to me at that point. seeing you there really helped me. all i wanted to do was crawl into the car and just shut things out. immediately upon finishing, mrs. k came up and introduced herself. she had brought the three kids along, too. we chatted for a bit and i joked around with the kids, calling each other every variation of "pickle-insert body part". "pickletoes", "pickleboogers", "pickleears", etc. the interaction with the kids was really welcome, if not a vivid reminder that i wasn’t at home with mine. i waited at the finish for mr. k to come across the finish. i ate what food there was available. i drank water, i stretched. i tried to tell myself that running 44 miles in those conditions was a pretty decent accomplishment. it was hard, though. i kept wondering what would have happened if i’d headed up to the summit. would i have caught mr. k? would i have turned around and run back down with him? would his company have been the buoying effect necessary to get me the distance i needed to finish? finally, we got word from a volunteer that mr. k was nearing the finish. a couple minutes later, we could see his solitary headlamp dancing down the trail. 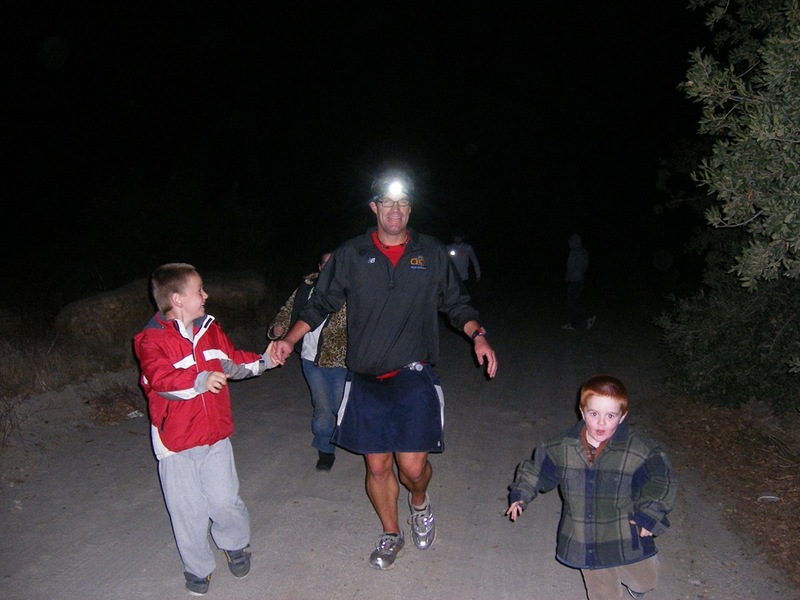 the kids and i headed up the trail to cheer him in and, as he came into view, the kids ran up to him, cheering wildly for their dad and ran comfortably across the finish. i was in awe of his accomplishment. he, without any protection on his legs, had braved those ridiculous weather conditions and had bested the route. hats off, mr. k. you pulled off a stellar performance. the one thing that continued to stick in my head, though, was the thought that by making a poor decision as a husband, i had been handed a poor day on the trails. funny how that works out, eh? now, it’s time for some rest and reflection. don’t expect to see me on the trails for a while. i’ve got some redemption to work on.